Millennium Sports Club specializes in one-on-one personal training and offers cutting-edge classes, FREE childcare for all members while exercising and outstanding service to all of our members. Offer you the essential suppliments to workout! Free child care while you work out! First Time Client would receive one free intruoductionary lession! Personal attention to boost your performance! I love Millennium Sports Club, and have been a member for about three years. 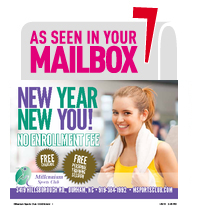 If your goal is to get fit in a well-maintained, CLEAN, friendly, diverse environment, then this is the place. Contracts are fair and transparent, and the managers are helpful in dealing with any issues (rare.) Bring your own towel and drinks. Prepare to enjoy a workout surrounded by people of healthy body and mind.True story. xtensive equipment I used was mostly reasonably new and/ or well-maintained. LOTS of treadmills, tons of both machine and free weights, areas for aerobics/ stretching, etc. I rank Millenium Sports Club near the top as it has pretty much everything I typically look for in a gym. It's affordable (and they have a bunch of discount deals to try and help your wallet out), you really never have to wait forever to use a piece of equipment or some weights. Maintaining a healthy lifestyle…the most important factor in determining your overall health. Millennium Sports Club recognizes that health and fitness is much more than just lifting weights or running on a treadmill. We provide the resources and motivational assistance you will need to reach your health and fitness goals. Whether your goal is weight loss, strength training, rehabilitation, or general conditioning, our programs and staff are here to provide you with a safe and effective workout. Our commitment to service and quality programming can be seen throughout the club. We know you will look forward to each workout session in our fun and relaxing atmosphere. Keeping fit is not just a fad – it’s a way of life. Our managers can explain all of our programs and partnerships. Since we are constantly updating and working on new programs, please ask one of our managers if there is a partnership with your employer company. We offer special rates for all teachers and school employees in the surrounding area! Orange, Chatham, Durham, Wake and Alamance Counties... Inquire at your health and life insurance company to see if any reimbursement dollars are available to you for working out and staying healthy. Kudos to you for all of your efforts! A brief listing of some of some of our partnerships include: Duke LIVE FOR LIFE Program, University of North Carolina Employees, Educator Extra Card Discounts, Global Fit - Ask your employer if you can become a member! Today, every company must be on the cutting edge in every aspect to stay ahead. This includes the benefits each company can offer their employees. We make it possible for companies to offer full membership privileges to their employees through convenient payroll deduction, with no final cost to the company. Of course, if the company would like to foot the entire bill, the employees very rarely complain! Investing time in your employees’ health will result in a winning situation for you and your staff. An added value to your company would be to invest in nutritional counseling... one-on-one or group sessions are available. We also offer a nutritional speakers series... Millennium Sports Club is here to assist you with these goals. For more information on how, call Patrik at (919)384-1992 or email him info@msportsclub.com. Some Companies have achieved as high as $6 savings for every dollar spent on wellness and incentives (Fitness Incentives Take Hold, OC Metro, May 2006). Obesity costs corporations $13 billion per year in medical expenses and lost productivity (The Institute on the Costs and Health Effects of Obesity, March 22, 2006). According to the US Department of Labor and Statistics, by the end of 2006 healthcare costs were estimated to be $2.2 trillion in the United States. They are now projecting these costs will rise over 3 trillion dollars by 2012. Interested in setting up a Personal Training Session? Would you like to discuss your needs with a Personal Trainer? Email, call or stop by the front desk and we will have a trainer speak with you today! We have both male and female trainers. Working with a personal trainer is the safest and most effective way to achieve your health and fitness goals. Whether you are looking to lose fat, gain muscle, reduce stress or increase your strength and flexibility, we can help. Our trainers and Dietitian will provide you with the guidance and knowledge you need to achieve the results you desire! By carefully analyzing your personal goals, nutritional intake, exercise history and fitness assessments, we will design an exercise program that is safe, effective and specifically tailored to your individual needs. Laurie Conteh, MS, RD, LDN is accepting new clients for nutrition consultations and accepts most insurances. Laurie has been a registered dietitian for over 10 years. She has worked in a vast amount of areas including but not limited to: weight management- adults and pediatrics, eating disorders, diabetes, food allergies, bariatric surgery, gestational diabetes, transplant, sports nutrition, and women’s health. She has a certification in Adult and Pediatric weight management as well. She has a passion for nutrition & helping others reach their goals. 1)Present I.D. tag each time you enter. Replacement tags are available for a $5.00 fee. 2)Guest passes are $10 per day and guests must provide a valid photo I.D. 3)Every member and guest is required to have a workout towel to use the facility. 4)Wipe down equipment with sanitizer after each use. 5)Talking on cell phones is restricted to the front lobby area only. 6)No resting on equipment. Allow others to use equipment between sets. 7)Padlocks are not to remain on lockers overnight. Locker rental is available for a monthly fee. 8)Appropriate exercise attire and shoes must be worn. Sports bras must be covered by T-shirts. Shirts cannot be open along sides.Shoes must be clean and free of debris. 9)No excessive vocalizations, “grunting”, or loud noises. 10)Minimum age for membership is 13 years of age and must be accompanied by a parent or guardian who is also a paying member. 11)The minimum age to exercise independently is 16. 12)Open beverage and glass containers are prohibited in the exercise areas. Water bottles must be used in workout areas. 13)Gym bags and gear must be stored in a locker and not on the gym floor. 14)Children cannot be left unattended in any area of the facility. 15)No children older than 1 year old in the locker rooms. Please use the designated family bathrooms. 16)Personal Training by authorized Staff Only. 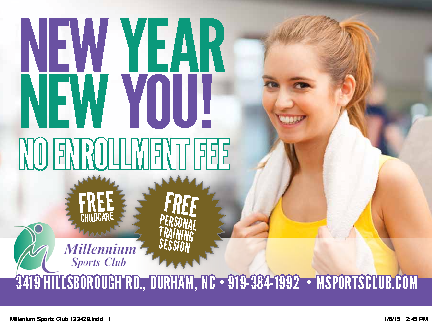 Millennium Sports Club specializes in one-on-one personal training and offers cutting-edge classes, FREE childcare for all members while exercising - and outstanding service to all of our members.